Writer-historian Jenna Cade has spent her life in search of the past, particularly with her latest quest to document abandoned cemeteries of the South and the stories behind the stones. But her search for a forgotten graveyard in quaint Sylvan Spring leads her to more than the ghosts of graves untended by human hands—it leads her to the doorstep of reclusive stone carver Con Taggart. Still grieving his wife’s death, Con has shut himself away from the world, But then a beautiful historian shows up at his door seeking a link between mysterious burial stones and a legend that lingers in the town's history. Working together to uncover the truth behind the lost cemetery may form a deeper connection between them than either realizes. 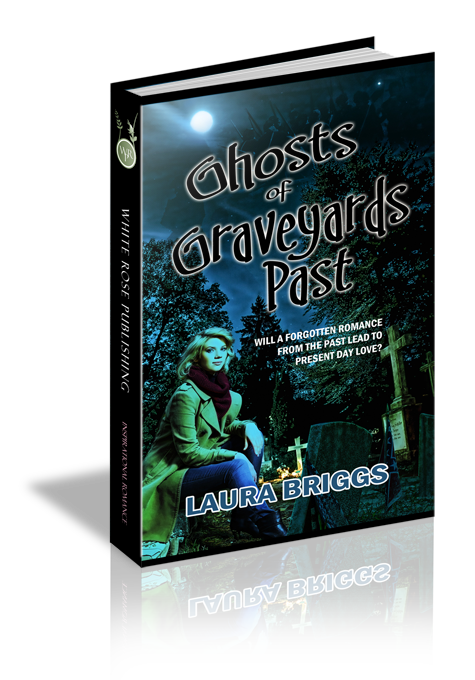 Can the ghosts of graveyards past show these two how to trust in God and to find a love more tangible than any legendary tale of apparitions? It was mid-October, with crimson and yellow leaves curling away from branches on trees that lined the highway. Ignoring the chill in the air, Jenna Cade lowered the rental car’s windows. The cool breeze fanned strands of gold hair before her eyes and rustled the map beside her in the passenger seat. Her destination, a rural town in Alabama, had been circled in red. Three months and four states had slipped past since Jenna first began her journey. Not a pleasure trip, but a tour in search of the Deep South’s forgotten burial grounds—cemeteries dating back hundreds of years, somehow lost in the fray of time and property development, their existence little more than lore to those living around them. Such gravestones were scattered across wooded hollows, remote pastures lands, even the muddy banks of a swamp. Hallowed grounds haunted by nothing and no one, Jenna’s feet the first to tread their soil in decades for all she knew. ”Dead Cemeteries,” as her agent, Joyce Edel, referred to them. Jenna preferred the less macabre Stories Behind the Stones, a title penciled in the notes of her work portfolio. Its pages bulged with material from visits to sites in Georgia, Tennessee, and Mississippi. Photographs and gravestone rubbings mostly, her observations recorded on a handheld device she kept in her knapsack. Other oddities greeted her past the acres of brush and bramble. In one place, the hollowed shell of an old church watched over the monuments, its stone foundation the only part untouched by the flames of a past fire. “I know,” said Jenna, the same photos spread before her on the bed. She had never seen anything look so desolate, even when researching a manuscript for the communities rendered ghost towns by the railroad deals. She had dug broken pottery and arrowheads from the dust of former Native American villages, but this was her first time to unearth someone’s headstone from a deserted landscape. She tried to imagine her own grave in some isolated wood someday, thorn plants tangled round the moss-encrusted stone. Unlikely, considering the Cade family’s attentive nature for previous generations, with family burial plots and with memorial and decoration days observed every year since she could remember. But then, hadn’t someone cared for these individuals, as well? It was this last option Jenna hoped the book would set in motion. If she could put a story with the stones, then readers might feel a connection to neglected cemeteries in their towns and neighborhoods. But how did one describe a stranger’s heart or capture the tone of a voice long since faded from any ear? The answer evaded her as she crushed carpets of poison ivy to find just a pile of rocks for a marker or sometimes deep impressions in the earth where a grave may or may not be planted. Babies’ graves were the easiest to identify. She knew them by the sight of a lamb’s shape etched into the surface, or sometimes a single flower severed from the stem. A broken sword might represent a youth cut down in his prime, a broken branch the same. Slave cemeteries, she learned, were nearly impossible to document. The few inscriptions were chipped away by harsh elements, the limestone crumbling beneath a green film no amount of scrubbing would ever remove. There had been one in Mississippi—a boggy strip of acreage known among the locals as Angel’s Pass—where the tombs were half-swallowed by greedy, spongy brown earth. Jenna’s boots sank, her knees caked with mud as she knelt to examine the damaged markers. Even the ones lacking names bore traces of a design, or maybe a special curve in the stone’s shape. Proof that someone, somewhere, had once cared. Such markers were too fragile to withstand even the gentlest of gravestone rubbings, the stone yielding a hollow sound when she tapped it with a pencil. She photographed them instead, angling mirrors to slant the sunlight so it bathed the carved portions in shadow. That was an old trick, one safer than brushing the cracks with flour, or wrapping the stone in tin foil to make an imprint. “Believe in ghosts?” more than one person asked whenever she spoke of the project in the towns surrounding the cemeteries. Their mouths would quirk in a sly smile as they waited for her response. The answer was always the same: a firm “No,” a shake of the head, and a faint laugh. Her fingers instinctively moved to the silver cross around her neck, a graduation gift from her parents when she left their family home for the university in Annapolis. Faith in her Heavenly Father had long ago replaced any childish fears she might have harbored for phantom visitors stealing between this world and the next. These days, her sole fascination lay with how the people lived before the flesh had wasted into bone, and, from there, into dust.